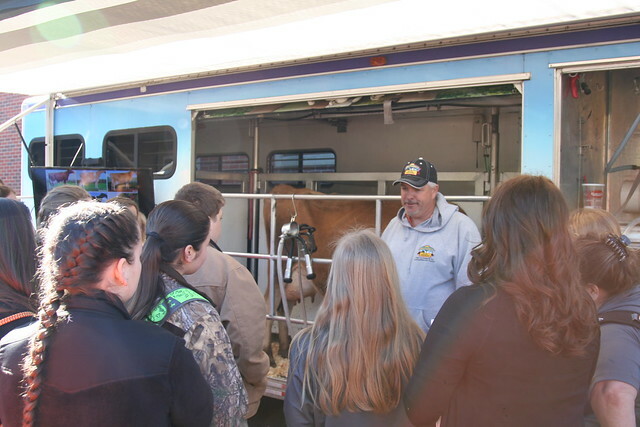 Thirty-four Arkansas 4-H members, ages 11-16, caught a glimpse of their future with a weekend field trip to the Oklahoma State University Center for Veterinary Health Sciences on April 1-2. The trip is part of the new Arkansas 4-H Veterinary Science program, which is led by Heidi Ward, extension veterinarian for the University of Arkansas System Division of Agriculture. Why Oklahoma State? Arkansas does not have a veterinary college. “All the students indicated that they learned much from the OSU presentation on what it takes to get into veterinary school,” said Heidi Ward, an extension veterinarian with the University of Arkansas System Division of Agriculture. At OSU the students attended a class on veterinary school admissions, visited the large and small animal hospitals, watched dog agility demonstrations and learned about horse physiology and how to milk a dairy cow. The students came from Clark, Craighead, Cross, Faulkner, Greene, Hot Spring, Jackson, Lawrence, Polk, Pope, Randolph, Saline and White counties. On the way to Stillwater, they stopped in Fort Smith at OK Foods where staff veterinarian Blair Telg presented a program about veterinary medicine for poultry. More information about the 4-H veterinary science program is available from your local Cooperative Extension Service agent and at www.uaex.edu.